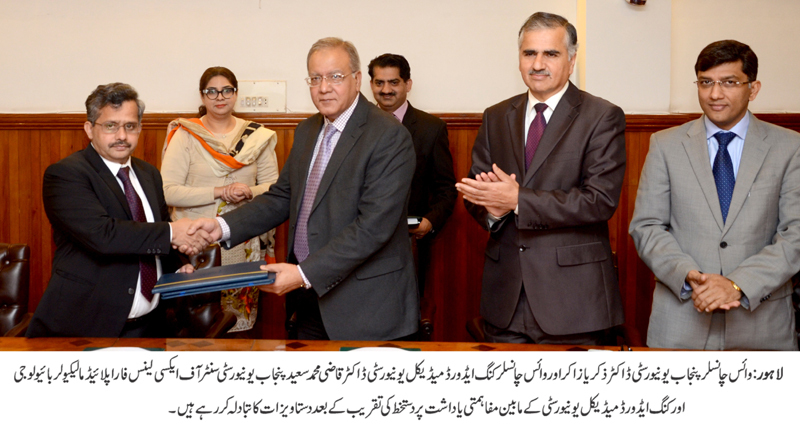 LAHORE: (Thursday, February 1, 2018): Punjab University Centre of Excellence for Applied Molecular Biology and King Edward Medical University have signed a memorandum of understanding for cooperative and collaborative research in molecular biology. In this regard, a ceremony was held at committee room of vice chancellor’s office. PU Vice Chancellor Prof Dr Zakria Zakir, KEMU Vice Chancellor Prof Dr Kazi Muhammad Saeed, PU Dean Faculty of Life Sciences Prof Dr Naeem Khan, CAMB Director Dr Nadeem Sheikh, Director External Linkages Dr Fauzia Hadi Ali and others were present on the occasion. According to MoU, both the parties would launch joint research projects and participate in ongoing projects. Moreover, KEMU would facilitate in providing patient and control blood samples along with patient information from its allied hospitals for research purpose while CAMB would provide the services of DNA Core Facility for DNA sequencing and genotyping. The parties would launch student exchange program and organize conferences, seminars etc.